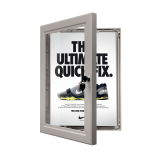 If you are looking to display a poster externally, then a Lockable Snap Frame may be the best tool for the job. 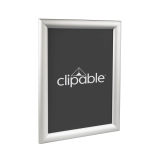 This Clipable poster frame has a lock on the front which is opened and closed with an allen key, making it tamper resistant. This way, your can rest assured that your poster won't be removed or defaced when your business is closed. This lockable snap frame is designed with a sequential locking system, meaning the frame profiles can only be opened once the locking profile has been released. The frame on this product is 32mm thick with a 19mm projection, which is ideal for outdoor use as it adds extra grip to your posters. The frame is also built with a lock on the front. 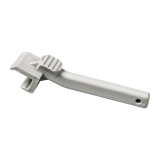 Our 32mm clip frames are slightly more expensive than our 25mm frames as they boast extra grip and security for your graphic. I would like this frame in a different colour, is that possible? Yes, our Snap Frames can be powder coated to almost any colour. If you would like to order a different colour, just give us a call today to create your bespoke Clipable frame. Changing your poster is still simple as the click frame front opening mechanism is still the same. You will have to unlock the frame with the allen key, open the frame and remove your poster and replace with your new one, remembering to lock the frame once finished. How is my poster protected? A PVC poster protected is included which is both anti-glare and UV protective so that your poster will always look it's best. I am going to use this Snap Frame externally, what paper should I use? For best results and longevity, we recommend printing onto a waterproof based insert such as polypropylene. This way your poster won't run if it comes into contact with water or condensation and won't crease the same way standard paper would. Yes, all of our Snap Frames include a high quality rigid styrene plastic back panel that helps support your POS display and keep your poster in place and neater for longer. Please note, these frames are not fire resistant as standard, but if you require fire resistant frames please enquire directly. Some of our snap frames were being opened by passers by so we invested in this lockable version and it is much better suited to our location and needs. Recently added this to the entrance of our bar and it is much better than any snap frames we have used previously. Very happy that it locks! B2 paper is the size inbetween A1 and A2. It measures 500mm x 707mm or 19.7” x 27.8”.